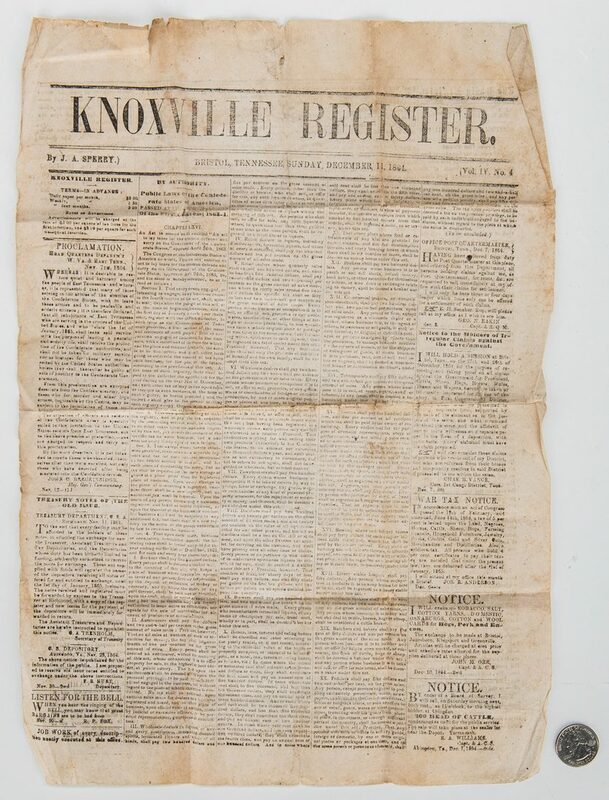 The Knoxville Register newspaper, published by J.A. 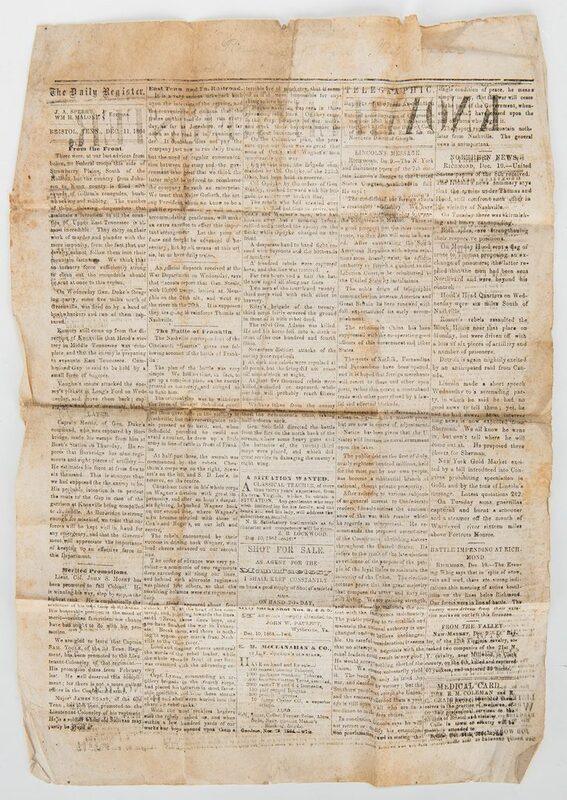 Sperry, Bristol, Tennessee, Sunday, December 11, 1864, containing reports of various Civil War related news including a Union account of the Battle of Franklin (Nov. 20, 1864), Lincoln's Message to the U.S. Congress on December 9; the promotion of Lieutenant John S. Mosby, along with front page notice of The Public Laws of the Confederate States of America; and other, more routine news of the day and advertisements. The report of the Battle of Franklin, located on the back page, provides an in depth description of the events, stating "The original plan was to withdraw the force of General [John] Schofield until the meeting of the enforcements, and then give battle in the vicinity of Nashville, but the over-sanguine rebels pressed us too hard, and when Schofield perceived he could not avaid [sic] a contact, he drew up a little army in line in front of Franklin…Gen. [John Bell] Hood appeared about four o'clock, P. M. at the head of his command, and, pointing towards the lines, said 'Break those lines boys, and you have finished the war in Tennessee. 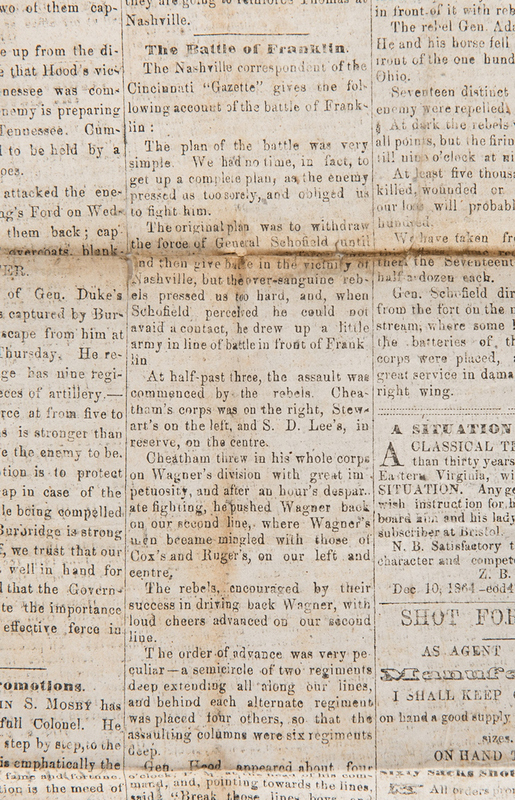 Break them, and there is nothing to oppose your march from Nashville to the Ohio river'…Capt. Lyman commanding an artillery brigade in the fourth corps, had placed his batteries in most favorable positions, and from these storms of shot and shell were hurled into the charging rebel ranks. 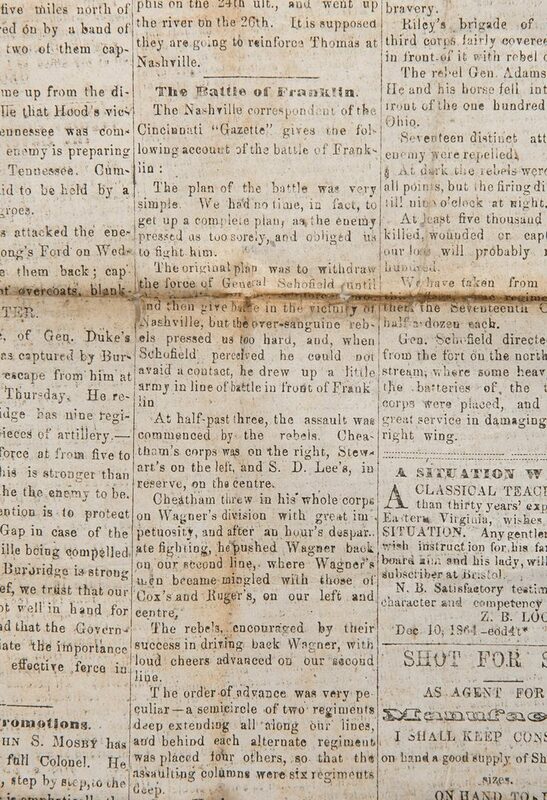 With the most reckless bravery still the rebels rushed on, and when within a few hundred yards of our works our boys opened upon them a terrible fire of musketry, that it seemed as if it were impossible for anything to live before it…At least five thousand rebels were killed, wounded or captured, while our loss will probably reach fifteen hundred. We have taken from the enemy their flags, some regiments, among them the Seventeenth Ohio, taking half a dozen each. Gen. Schofield directed the battle from the fort on the north bank of the stream, where some heavy guns and the batteries of, the twenty-third corps were placed, and which did great service in damaging the enemy's right wing". Also included, on the front page, is a proclamation from the headquarters of the War Department of West Virginia and East Tennessee of November 7, stating that "all inhabitants of East Tennessee who are serving in the armies of the United States, and who before the 1st of January 1865 shall leave said service, with the purpose of leading a peaceful and orderly life, shall receive the protection of the Confederate authorities, and shall not be taken for military service, nor as hostages for those who may be seized by the United States authorities, unless they shall thereafter be guilty of acts of hostility to the Confederate Government". 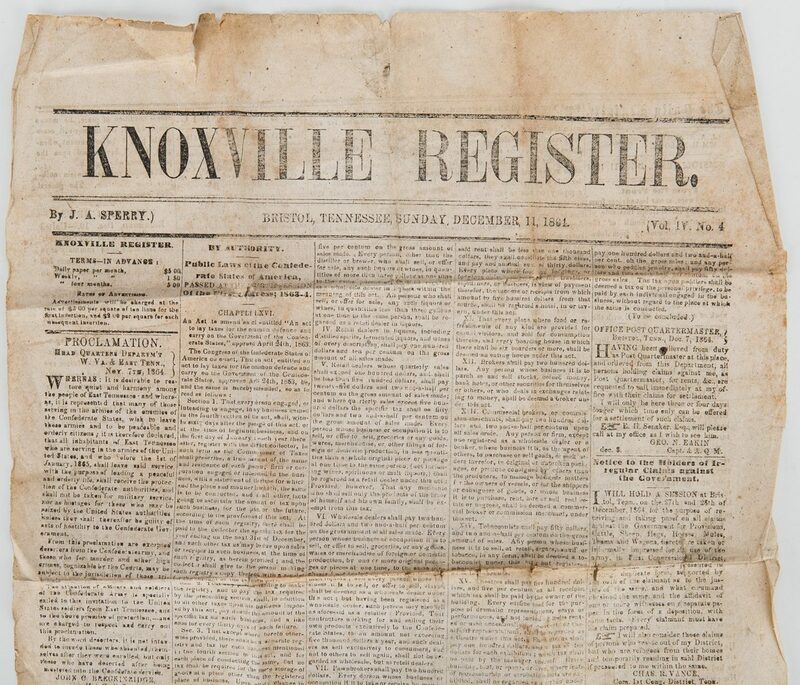 16 3/4" H x 11 3/4" W. Note: The Knoxville Register was founded in 1816 by Frederick Heiskell and Hugh Brown. 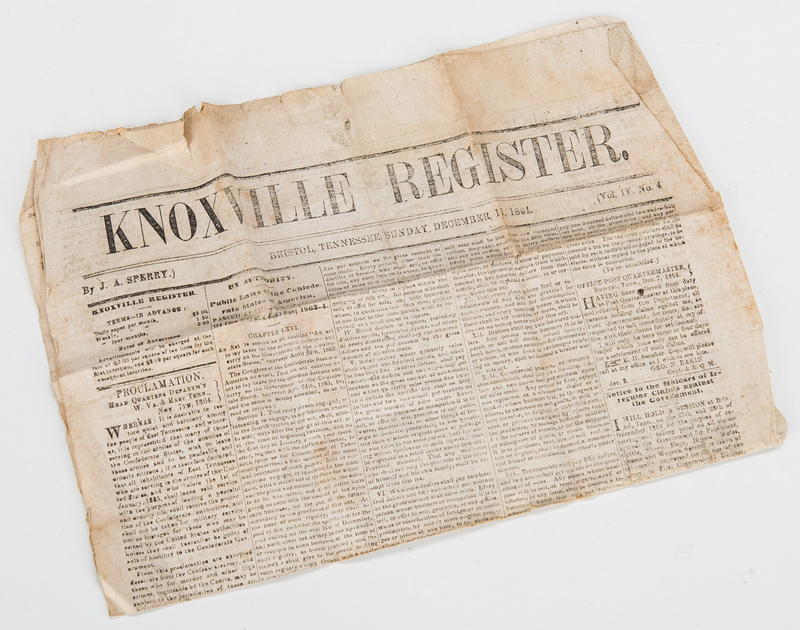 It was East Tennessee's main newspaper until 1863. 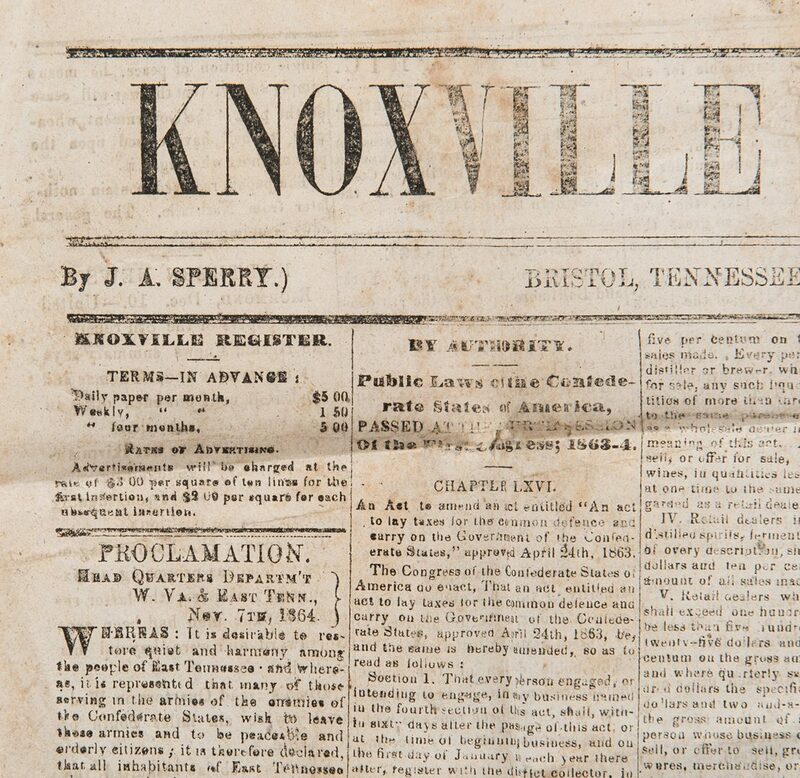 By that time, it was headed by Jacob Austin Sperry (1823-1896), a pro-secessionist who was forced to flee advancing Union forces as the Civil War progressed. 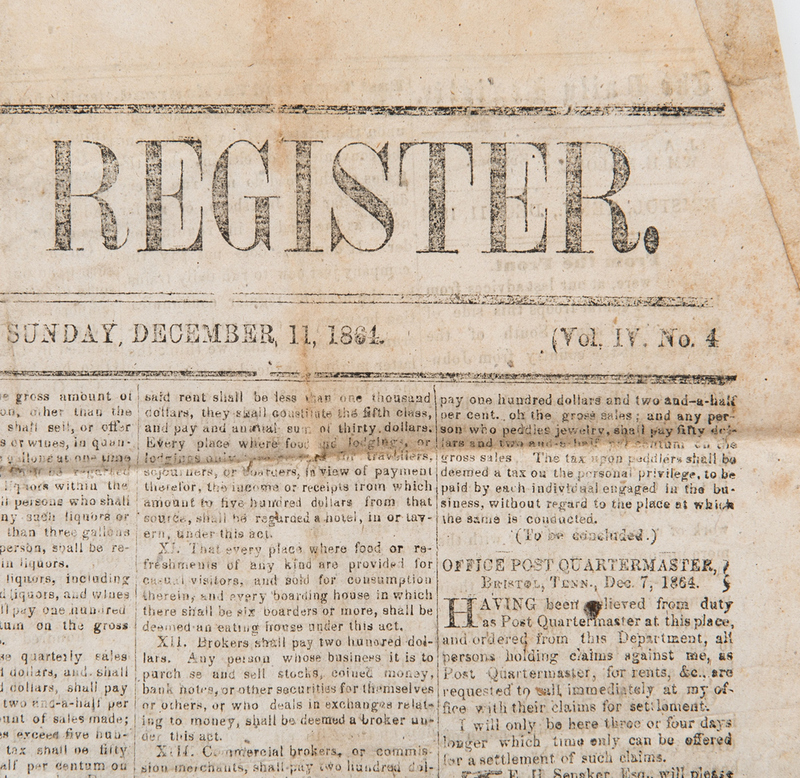 Sperry was able to publish the Register sporadically from Atlanta and later, Bristol. 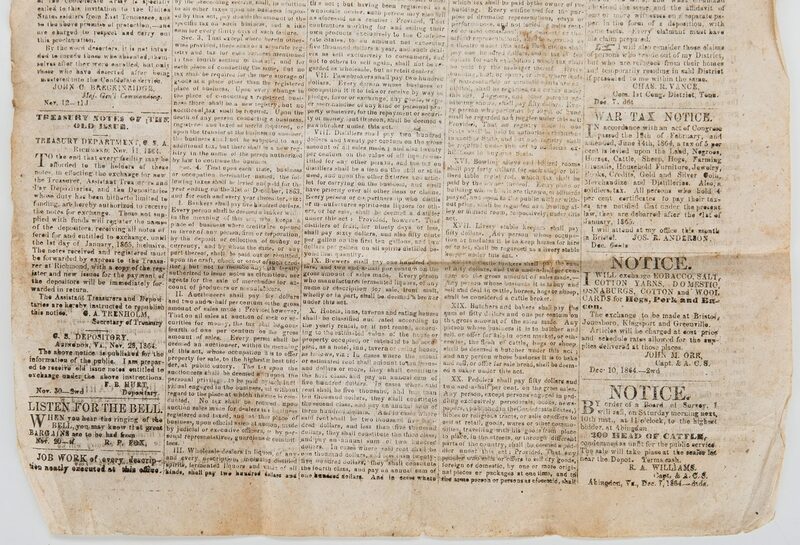 This is likely the last edition of the paper published before he was ultimately captured by Union forces later that same month (making the proclamation of sanctuary for Union deserters on the front page all the more ironic). 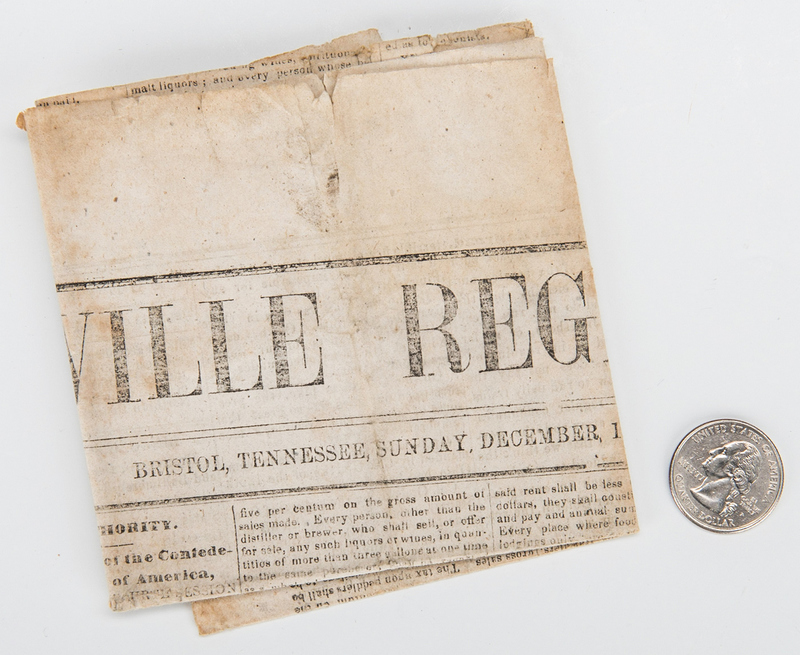 Provenance: descended in the Henry Bowers family (see related archive lot 259). 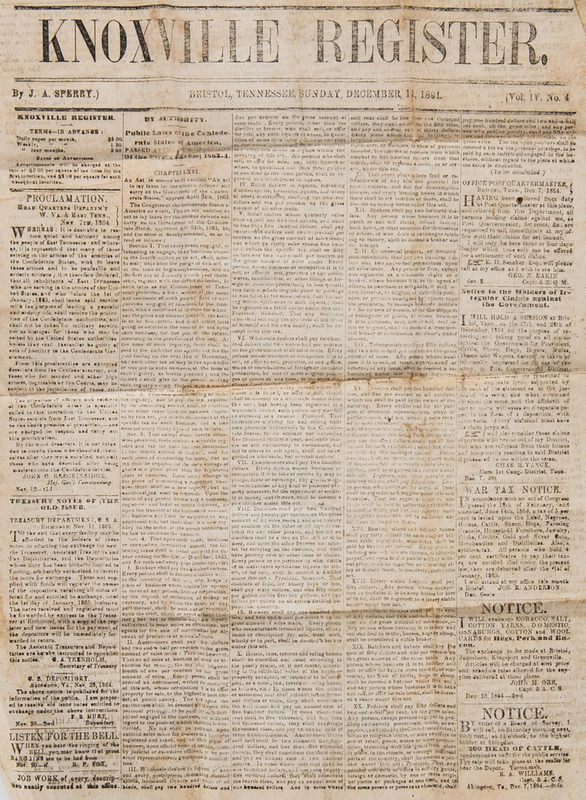 CONDITION: Center fold line with toning and small losses, small edge tears up to 1/2", some fading and toning, edge folds, faint pencil inscription at top.